1. What is the Size of a Horseshoe Pit? We know how important it is to have your game set up better than your neighbor! 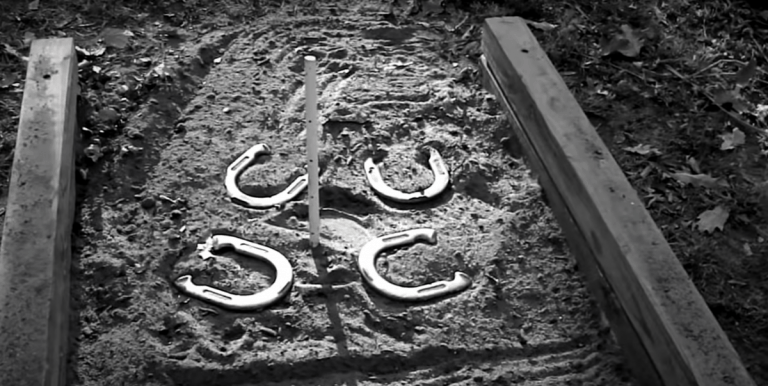 In this article, we want to teach you how to set up the regulation horseshoe pit. We’ll give you tips, ideas, and tell you about a couple of horseshoe sets you’ll love. Gathering all you need before starting up your project is key to successfully building a horseshoe pit. It doesn’t matter if you’re playing with a professional horseshoe set forged in steel, such as the St. Pierre Horseshoe Set Professional Series or with a less expensive rubber horseshoe game kit, such as the one proposed by Champion Sports. The pit must have the same characteristics if you want to play by the rule. According to the horseshoe regulations, the official horseshoe pit dimensions measured lengthwise from the rear of the pitching area and across the width of the pitcher’s box is 48 x 6 feet. This playing area consists of a pitchers box measuring 6 x 6 feet, and that includes four elements: the Pit, Pitching, Platform, and Stake. Those with small backyards often believe they can change the horseshoe game dimensions based on the size of their lot. While this is possible if you only want to have some summer backyard fun, if you’re going to enjoy the real horseshoe game, you should stick to the original sizes. The Pit: Can have various sizes. The horseshoe rules call for a minimum of 31 x 43 inches and a maximum of 36 x 72 inches. The Pitching: Is a platform extending the width of the pit with up to 20.5 inches. The Platform: Is usually used by younger players and extends the pitching by ten additional feet. The Stake: Adds verticality to the pit, extending it upwards with 14 to 15 inches. Stakes should slightly tilt forward. Besides these four elements, you must also build a pit backboard (also called a backstop) and position it at about 12 inches beyond the pit so that it can stop wayward horseshoes and sand or the clay. While the above dimensions for a horseshoe pit are those that are set up by regulations, nothing stops you from building a smaller pit if you don’t have enough space in your backyard. The beauty of lawn games – horseshoes included – is their flexibility. If you do have enough space though, know that horseshoes regulations require to set the stakes at precisely 40 feet apart . In other words, the distance between horseshoe stakes (or pins, pegs, poles as others call them) shall be 40 feet. The game also involves two pit boxes, one for the stakes and one for pitching. 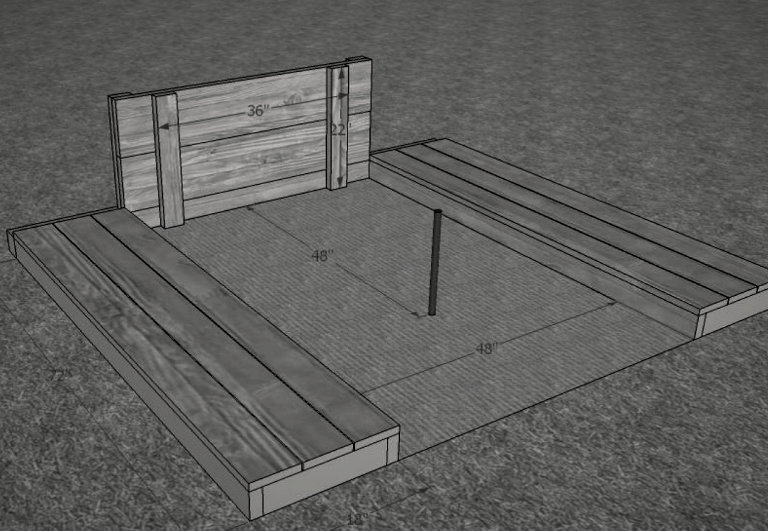 If space is limited, you could make it with only one box, reducing the horseshoe pit length by 24 feet. Besides accounting for the dimensions of a horse shoe pit, you must also consider its orientation. If you want to play comfortably all day long without worrying about sunshine blinding you, a north-south direction is desired. Assuming you have sufficient space and DIY enthusiasm to build the layout for two backyard horseshoe pits, you will need four pieces of lumber, four 31-inch long pieces and four 43-inch long pieces (or 36 and 72 inches if you want bigger box sizes). It’s easy to imagine that you’ll only need two of each if you decide to build a single pit. Once you’ve cut the lumber to dimension, use two pieces of each size and appropriate fasteners to assemble a rectangular box. Depending on the type of lumber you used, you will need either galvanized screws, spikes, or rebar to put the pieces together. If you’ve made it through here, you might think that merely setting your boxes on the ground could do. But that’s far from the truth. While it might suffice, you’ll never look professional while throwing the horseshoes. If you want to hear the whole neighborhood talking about your horseshoe pitches, it’s time to get your hands dirty and dig some trenches. A shovel is perfect for the purpose, or you could use a walk-behind trencher or tiller if you don’t feel like wasting too much elbow grease. It’s useless to say the trenches must have the same size as the boxes so that they can sit flush to the ground. We’re almost there, all you have to do now is set your stakes. Measure a minimum of 21 inches from the front of the box and stick them into the ground, making sure that they stick out at least 14 inches from the field. The stakes must also lean toward the other box at an angle of about 3 inches, so account for that when setting them. Don’t worry if they look somewhat unstable at this stage. You’re going to fix them with sand in the next step. At this stage, you could grab a bag of sand and pour it into the box. But hold your horses. Weeds growing out from the sand aren’t precisely pleasing from an aesthetic standpoint. While this step is optional, we recommend placing a layer of landscaping fabric on the bottom of each pit. This liner suppresses weed growth but also gives stability, keeping the sand from sinking into the ground. Now, you can fill the horseshoe pits with sand. Playground sand or horseshoe pit clay is readily available in most home and garden stores and is your best bet. As a rough idea, you will need about five to six bags for each pit setup. That’s it! You can now grab your professional horseshoe set and start pitching. Could you imagine summer without enjoying a fun horseshoes game set up in the backyard? If the answer is no, you’re one of us! Finally you’ll want a pit backboard 4′ away from the stake. Next you’ll need to place your stakes: Each stake shall be centered between the pitching platforms with a minimum of 21 inches (53.5 cms) from the stake to the front and back of the pit. On regulation horseshoe court dimensions the stakes are 40 feet (1220 cms) apart stake to stake. The substance that makes up your pit is largely up to you. Find something that is easy to obtain, like dirt, sand, or clay. We personally like playground sand. For a basic pit without the pitcher’s box and a simple blackboard you’ll need landscape timbers. Cut 4 of them 36′ long and 4 of them 48′. The 36′ landscape timbers will be used for the backboard, the 48′ will be used for the sides. Drill 3 pilot holes of 1/2′ in the 36′ landscape timbers. 2 pilot holes at each end and one pilot hole in the middle. Fill the box with sand, pound in your stake in the center of your pit and your done. From learning horseshoe pit design to building and setting up your boxes, it all matters towards the success of your game. While you could enjoy horseshoes by merely sticking two stakes into the ground, official horseshoe pits will add professional flair and will make you the star of the neighborhood. Thank you for your excellent instructions. After recent rains we want to upgrade our backyard pit to regulation so we are better prepared to play tournaments. I have never built anything before so this is extra fun!